I just looked up "chevron" on Wikipedia to see if there was anything interesting to learn about its meaning or why the design is so trendy in clothing and home decor these days. Zzzz. They said something about military rankings and heraldry and I took a short snooze. 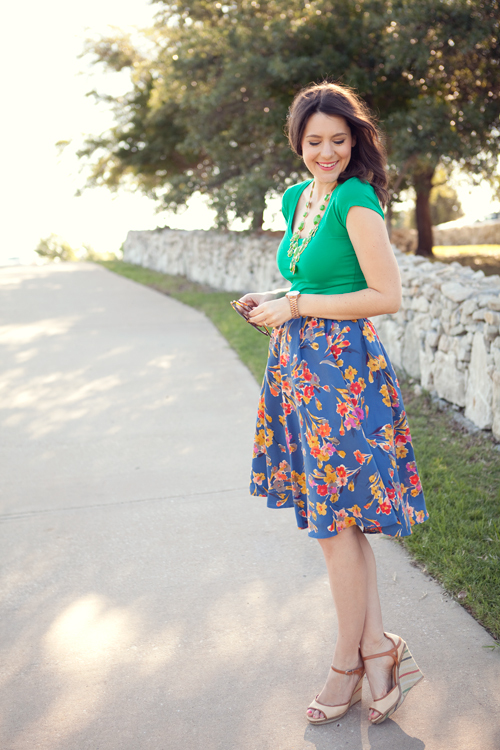 Whatever, this skirt print is super interesting. I love the print so much, in fact, that I think it's my favorite I've used of all my me-makes. Rich, saturated colors in a simple geometric design. The chevrons almost look like pixelated tulips in an Atari game or something. Plus it's BLUE and WHITE (and green). Me likey. The fabric is a cotton lawn I bought from Denver Fabrics online. Fun fact: Denver Fabrics is not based in Denver. Gross fact: The white tank in these photos is the nicest white shirt I have. I've never worked with lawn or even touched it but I assumed it'd be soft and luxurious. I guess that's just Liberty lawn, though, so this was a lil' scratchier than I expected. Like grass in someone's... lawn. The weave is loose so it frayed quite a bit, and it snagged pretty easily on sharp things like, you know, all the tools we use to sew garments. But the drape is lovely and I like its semi-sheer airiness. I had a full pleated skirt in mind from the get-go so I was looking for an easy-to-sew light fabric that wouldn't make me look like a cupcake. OK, I do still kinda look like a cupcake from certain angles. A delicious chevronific cupcake. I blame the lining. I lined it with the softest muslin I could find (give me a break, I'm already $50 over my sewing budget for the month so discount muslin it was), but I pleated it just the same as the shell fabric so it's pretty bulky around the waist. Do you make your skirt linings with equivocal volume to the main fabric, or should I not do that? I tried to speed through the project to wear it to a Memorial Day cookout, but those kinds of plans always backfire. The simplicity of this skirt design should have meant impeccable sewing with a tidy finish, but c'mon, who do you think I am? I tried the skirt on 20 minutes before leave-time with only hemming to do, and then the zipper got stuck at the thick waistband seam so I had to seam-rip it to break my body free. Fail. I wondered later if I could have hemmed it while wearing the stuck skirt so I could still meet my deadline and wear the skirt as planned. Ha. ha. ha. Hmm, still wondering. 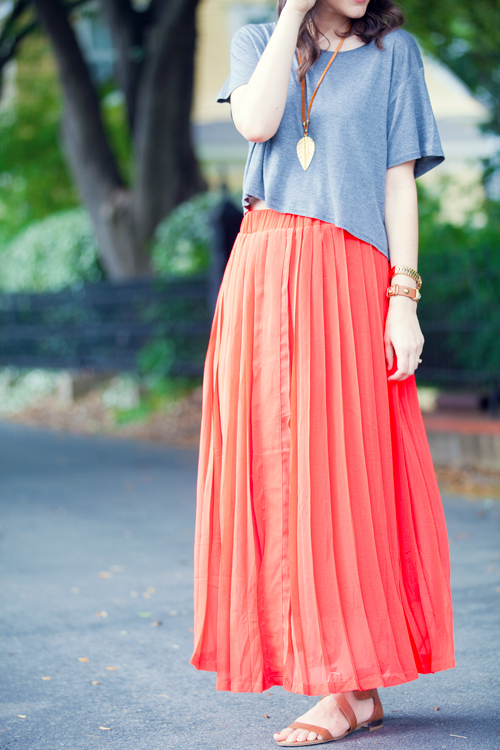 This is one of those o-wow!-now-that-I-understand-basic-garment-construction-I-can-make-skirts-without-patterns skirts. You know the ones: gathered or pleated rectangles with a shapeless 2-inch waistband and a zipper. Project R-way here I come. I did consult Simplicity 2215 for the pocket shapes and instructions on inserting in-seam pockets on a skirt with a side zipper. Cheater. Um, actually my skirt looks a lot like Simplicity 2215 all around, but my pleats are improvised and I didn't make a tabbed waistband. I decided to cut my waistband with the print going horizontal. I pieced it to make a little design element out of the chevrons so the arrows point towards each other at the center front and center back. It's slightly wonky because I had a lot of fitting to do at the waistband after I pieced it together initially. I had to GIMP all my mosquito bite bumps out of these photos (which are all so blurry and weird, sorry). Seriously, in the summer I can handle the humidity and my neighbors' outdoor speakers, but I can't handle being feasted on by these blood-sucking freaks (the mosquitoes, not my neighbors). It's infuriating, and I have no self-control when it comes to scratching. Ah, and it's not even June yet. So, what kinds of fabric prints do you love the most? Florals, stripes, animal, novelty, abstract, dots, chevron? The evidence is now undeniable. My city is increasingly becoming a sewing and fabric desert. For a city with a population of 600,000, this just shouldn't be the case! 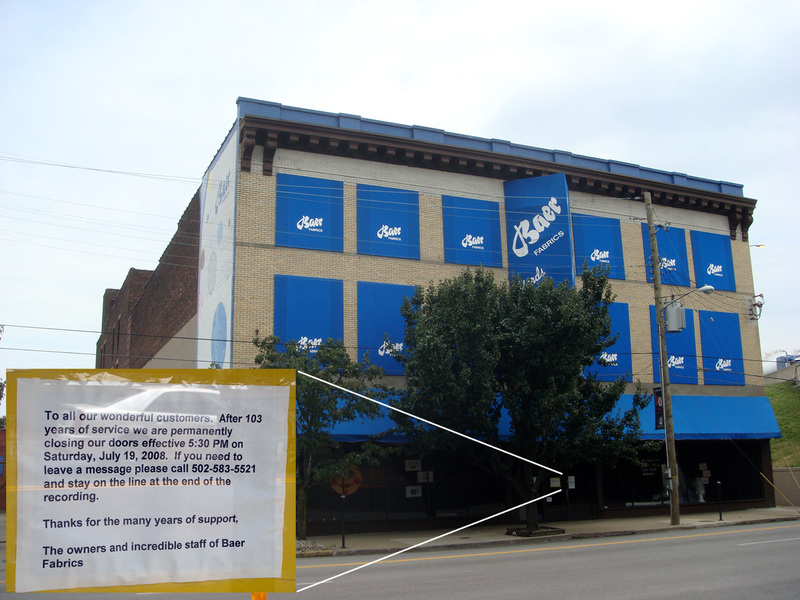 Evidence: First, it began with the amazing two-story Baer Fabrics downtown. It closed without warning several years ago -- after 103 years! -- and sent the city reeling. The employees didn't even know it was closing until the day before. The building still stands there today with its original signage and button mural painted on the side. A forlorn reminder of what-could-have-been for my current sewing life. I bet you can guess which apparel fabric stores are left. Sob. Evidence: I regularly visit thrift stores, flea markets, vintage clothing stores, antique malls and estate sales. Unlike the rest of you lucky people, I so rarely find fabric, patterns or notions at these kinds of places. Well, okay, there's currently a small collection of awful (and overpriced) 1980s sewing patterns at a local thrift store, but it's been the same small collection since I first discovered it six months ago. I ask these shop owners all the time if they know of anywhere else that sells sewing-related ANYTHING, and they just shake their heads apologetically, throwing out some unsure suggestions about someone they know who "might" have something like that in their store 15 miles away. Evidence: Last week I was making some girls' skirts and ran out of white cotton for lining. Instead of driving out to Jo-Ann, I thought I'd stop by the locally-owned quilt "shoppe" in my neighborhood. I'd only ever been in there once before because clearly it doesn't really cater to my needs as an apparel sewer. On that first visit I almost bought a rotary cutter but decided instead to go to Wal-Mart to get the same brand for a third of the price. Yes, totally shameful. When I arrived there this time, the store was dark and their signage had been removed. The only things that remained were a small "Closed" sign and some abandoned bolts of fabric on the floor. 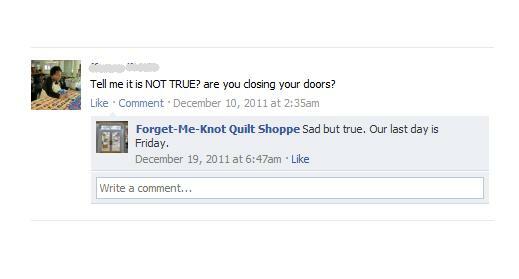 I went on their Facebook page and read that they had officially shut their doors in December. I can't help but blame myself for the local shop's demise because I'm cheap and bought my rotary cutters at Wal-Mart and my cotton broadcloth at Jo-Ann with a 40% off coupon on my iPhone. Evidence: Yesterday I helped my mom host a yard sale in her neighborhood, something we do on Memorial Day weekend every year. I contributed my usual RTW clothes and housewares, but this year had some fabric remnants and patterns I wanted to sell. I had about two boxes of fabric and maybe 10 patterns. I priced them all incredibly cheap, of course. There was even some Pendleton wool in there, people. A seamstress' jackpot, or so I thought. We had a ton of traffic throughout the sale, but out of my sewing-related stuff, I only sold one piece of terrycloth for 25 cents and one Cynthia Rowley pattern for 25 cents. WTF. I said to the customers who did buy something, "Alright, someone else who sews!" and they both just laughed and said "No, not really." For some reason I was hoping that through this process I'd meet other seamstresses and we'd start a sewing club and eat little sandwiches while discussing flat-felled seams or something. There's more to whine about, like how there aren't any sewing classes for anyone who wants to learn patternmaking or more advanced techniques; how the only craft fairs are Christmas fairs; and how the libraries hardly stock any sewing-related books. But, I'm tired of feeling sorry for myself and I have some sewing left to do today... with fabric I bought from the INTERNET. For the record, I love my city otherwise, I really do! How sew-friendly is your city? If it's like mine, how do you cope?? Now that I've worked with the Renfrew pattern and inevitably want to make 5,000 more of them and physically can't stop myself, I'm trying to think of ways to incorporate basic knit tees into my wardrobe in a not-so-basic way. I can't do it on my own, though, so I'm lucky that the Internet was invented primarily to help me learn how to dress myself. Thanks, Internet. AP style capitalizes your name for a reason. What have we learned here? 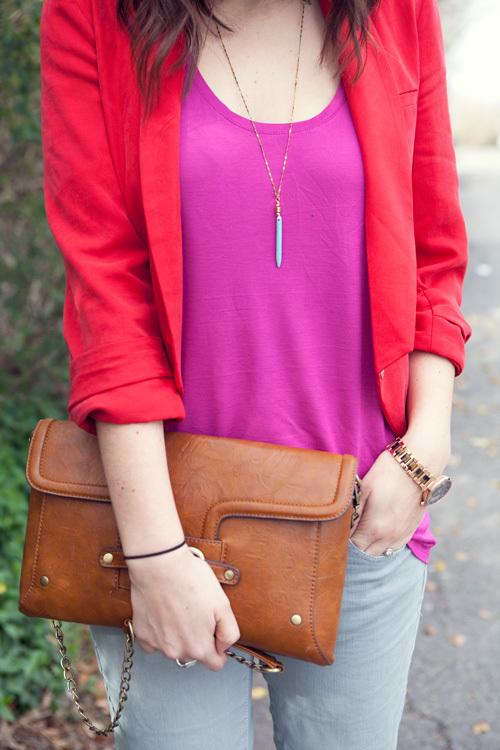 I need colorful flowy skirts and chunky jewelry and a cherry red blazer, that's all. Annndd maybe a husband who's a professional photographer, blog sponsors that send me free loot, and a gym membership. On it! I went on to make a short-sleeved Renfrew with the hopes of wearing it in a effortlessly chic way, just like Kendi does. Yet, all I've done is glare at the finished product with narrowed eyes for a couple weeks now. I'm worried about the colors, print choice and banded style. Very worried. I mean, I like the birds - I have another RTW bird shirt in poly chiffon, but "bird t-shirt" isn't what first comes to mind when I think of chic fashion. I don't know what I was thinking, but dressing up this top is quite difficult, at least with my current wardrobe. It's high time I solicit the advice and opinions of my dear readers. After all, I think of you as a support network for all my creative endeavors, so I can't be left alone to ponder whether I'm one of those people with, ahem, questionable taste. DOES MY NEW RENFREW LOOK LIKE A LITTLE BOY'S PAJAMA TOP? Tasia claims her Sewaholic Renfrew pattern can be made 9 different ways. Well, I have good news for y'allllll: it's actually 12 ways if you make them sleeveless! And 24 total ways if you lengthen them all into dresses! Please check my math. I won this pattern in Kirsty's giveaway a couple weeks ago. (Yeeaaa winning!) As I was walking up to my apartment after work last Friday, I spotted the little yellow envelope with that distinct Sewaholic font sticking out of my mailbox, and I practically sprinted up the porch steps to tear into it. I've had my fabric ready since, like, the day after I got Kirsty's e-mail so I was eager to whip this one up. I have to admit I was not thrilled by this pattern when it was first released. I don't wear casual knit tees that often --usually only when I exercise sleep-- so I thought I'd skip out on paying the high price for a pattern that wasn't really my style. Peer pressure got to me, though, so after I witnessed every other blogger fainting and fawning in massive groovy love heaps all over the Renfrew, I thought I should at least try it out and see what I could do to manipulate it in my typical way. Which means, o' course, make it a dress. Don't you know me at all by now? And I quite like it! It was so quick and easy, just like you all said, especially without sleeves. I started and finished it on Derby day, which seemed fast considering a large chunk of that day was actually spent at a cookout betting on horses and eating junk food. With a major mint julep hangover from Oaks night before.
? Yeah, so this place certainly has fabric you could make baby leggings out of, but I enjoyed eyeing some of their more classy florals, stripes, geometric prints and ikats. 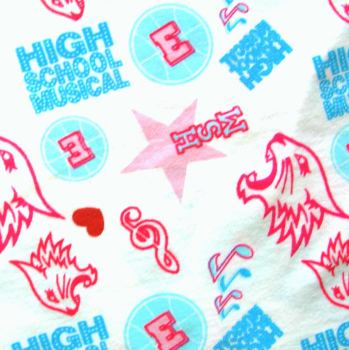 (OK, I do realize a 6-year-old would happily wear this fabric I bought for myself, but let's not get into it). This particular jersey was only $5.25 a yard, and it was actually printed on-grain. Hold the phone, hold it! Oh yeah, and I ordered the fabric on a Friday, they shipped it that afternoon and the box was on my door stoop that following Monday. WILD. Sorry for the crazed review about an online store, but as someone who enjoys sewing with knits but can never find any I like, I thought I'd share the tidbit with any Renfrew fans out there. I made a size 4 for the top part then fanned it out to a more generous A-line starting at the waist. I prefer my dresses to be at-or-below knee length when it's too hot to wear tights, for modesty reasons but also because I hate when my legs stick to chairs or leather car seats in 90-degree heat. This dress is about 40 inches from shoulder raw edge to hem raw edge. Ehh, yeah, that sure was a lot of stripes to match at the side seams. This self-hug shoulder kiss is truly the best pose I have for showing you the side seam. I promise the seam hangs straight & vertical IRL. I think. To bind the armholes for my sleeveless version, I used the same pattern piece as the neckline but shortened it to the circumference of the armhole. They were attached in the same way as the neck band. I should have shortened them a tiny bit more so they would fit more snugly and reduce some of the gaping. To hem the bottom, I stuck a long strip of 1/4" Steam-a-Seam to the raw edge, folded the hem under, ironed it to make the permanent bond, then secured it with a zig zag stitch. Can't recommend S-a-S enough, especially if you're looking to make a Renfrew without that bottom band. It helps stabilize the knit fabric so it doesn't stretch out and wonkify under the sewing machine's presser foot. I was afraid the fused part would take away the stretch of the fabric, but I found that's not the case. Seems like it could work well for unbound armholes and necklines, too. I'm pumped that I won this pattern and was able to make a casual dress that I know I'll wear often once the Louisville humidity sets in. THANKS SO MUCH KIRSTY! Generous seamsters make the world go 'round / make my summer wardrobe more rad. How many Renfrew tops have you made yourself? Dare to try a dress? Once upon a time there was a king size fitted sheet that was crumpled in a pile on the floor. Then, it lived happily ever after on my body. Le fin. Hey, more blue. More checks. More blue checks. Bleu-tiful. I made this blue-checked dress two weeks ago, but was kinda reluctant to post it around the same time as my blue-checked pajama pants, but I won't have any other final product to show you for awhile. My trip to Pennsylvania last week meant approximately six non-sewing days, which is torture for someone with a crafty addiction, as I'm sure you all know (...right?). My sewing machine nearly suffocated under its little plastic dust-repellent cover, something I admit I rarely use when I'm sewing daily. It grunted at me when I finally switched it on. Needy much? I've made this pattern before -- Simplicity 2177. It's a pattern that is easy to pass over, and I don't blame you for that since it looks totally boring on l'envelope. Of course, it's their fault for covering up the only interesting part of the dress --the front bodice with the two bias-cut pieces and triangle inset-- on the model. Sewing Commandment 1: Thou shalt not judge a pattern by its Big 4 envelope cover styling. I like the dress I made with the pattern last time (darkly pictured above and blogged about here), but I think I cut the hem too short for how stiff the fabric is. It's great for standing still and holding a beer at parties while gloating, "Yeah, I made this dress for like four whole dollars, so what? ", but it's completely indecent to sit down in, and I was emotionally scarred by my past experience of having to creep in slow motion through the grocery store so the skirt wouldn't ride up too much with normal leg movement. But since I like it otherwise, I wanted a second chance to make a more wearable version. Belt's a-slidin'. For this version I kept the skirt a little longer and lined it in something slippery so I can grocery shop at my regular speed (aka as fast as possible - I hate grocery shopping). I left off the facings and bias tape and just did the ole serge-and-turn method on the neckline and armholes. It's my preferred lazy-man technique. I also used an invisible zipper instead of a lapped zipper, and tapered in the side seams of the bodice a bit more. I tried my damndest to make the bust darts so they wouldn't be so, uh, pokey. STILL, they're a bit prominent. I think the angle of them, too, draws your eye to risque places, which I'm not really a fan of doing. Ohhhh well. This dress pattern has major back neckline gaping issues (more than usual for me). I've finally learned that I can properly eliminate that problem by simply creating two neckline darts, rather than improperly removing fabric from the upper back area. I've taken in fabric there in some blouses before and lemme just say, I look totally crazy when trying to blow dry my hair in those things due to the restricted arm movement. I don't know why most patterns omit neckline darts nowadays, because all humans have a curve from their necks to their backs even with good posture, right? Okay. Mr. (or Mrs.) Skeleton confirms it. Good to know I'm not a lone hunchback in a cruel straightback world. Please forgive & forget the enormous gap at the top of the zipper below the hook & eye. I forgot I had already finished the neckline when I attached the zipper, so there was no more seam allowance to turn over atop it. Oopsie doopsie. One day I'll sew a perfect garment and you'll be like, "Wow. That's a perfectly sewn garment" and I'll be like, "Thanks" and you'll be like, "It shows true dedication that you've been a sewing blogger for 56 years just to reach this point." And I'll try to take that as a compliment. So, until then, we will all just have to deal with my zipper gappage and indecent headlight darts and bodice drag lines and serged-and-turned armholes and mismatching polyester skirt linings and such. Here's to improvement! What color are you currently obsessed with? Anyone else on a blue kick?